Here is a heads up that you will be able to earn Triple Aeroplan miles on Costco.ca purhcases starting next week. Registration and use of promo code will be required. Find out more here. 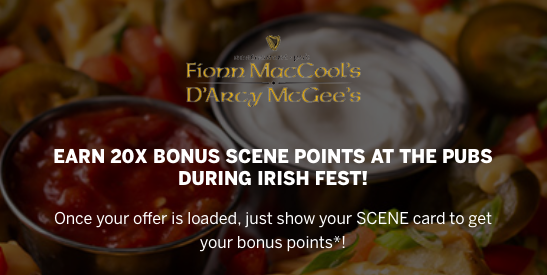 You can earn 20X SCENE Points during Irish Fest at participating Fionn MacCool’s, D’Arcy McGee’s, Paddy Flaherty’s and Tir nan Òg restaurants until March 16. Find out more here. and be sure keep an eye on our blog and social media channels over the next two days for a bunch of exciting updates and industry coverage!